In August, the Maryland State Highway Administration launched its 511 Traveler Information Service to provide motorists with real-time traffic conditions on the state’s highways. The project is part of the administration’s Coordinated Highways Action Response Team (CHART) program, which works with several state agencies to implement advanced technologies that provide a safer, more efficient transportation network. The CHART program, which began in the mid-1980s to improve travel to and from Maryland’s eastern shore, already had implemented changeable electronic messaging signs, highway advisory radio and a website to inform the traveling public of delays and traffic conditions on the state’s highways. To complement those communication channels, the State Highway Administration wanted to offer a telephone service already used in other states that enables travelers to dial the “511” code to access traffic information. In October 2010, the agency contracted with Rockville, Md-based Telvent to implement, operate, host and maintain the 511 service. The company provided an automated Interactive Voice Response (IVR) telephone system for users to dial “511” and use voice commands to access traffic information. A companion website shows traffic information and live traffic cameras through a map-based interface. 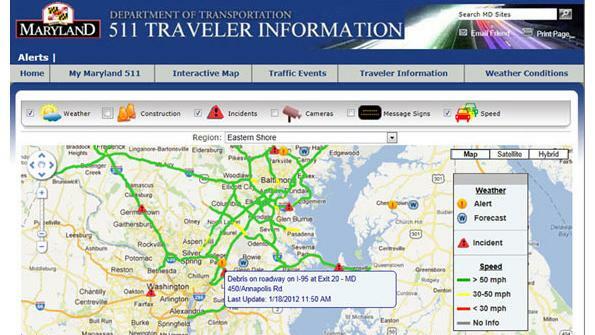 Through the service, Maryland travelers gain instant access to information on traffic jams, incidents, road construction and weather delays, including information from the Northern Virginia suburbs. Travelers can customize the service by identifying regularly traveled routes so that when they log on to the 511 website or call the IVR system, they immediately receive customized updates. Maryland’s 511 Traveler Information Service now provides information to an average of 14,000 callers and website visitors each week. The service helps travelers better plan trips and avoid traffic congestion, improving the mobility and safety of drivers in Maryland. The Maryland State Highway Administration also has created a Twitter account for the 511 Traveler Information Service with real-time travel information updates. The administration is planning additional enhancements to the traveler information service, such as text and email notifications.